Having some fun today playing with paper and clear silicone (the stuff you caulk your tub with). I picked up the silicone on a recent trip to Target for about $3. Don't you love a store where you can buy silicone and a gallon of milk? For this project, the silicone must be clear, not white. I cut a few sheets of 12 x 12" paper (this one is from the Camden Collection) into 6" wide strips. Put your paper on a craft sheet or an old newspaper. Squeeze some silicone onto the top of the paper. Use a scraper (or an old credit card) to pull the silicone down the paper in a thin even layer until the paper is covered. Super easy. But here's the hard part...leave it alone and don't touch it for a few hours. I'm not so good at not touching to see if it's dry so I usually have to put it in the garage or leave the house and go to Target. The paper I made was dry in a couple hours but it felt even better the next day. The silicone puts a plastic type coating on the paper. I put on very thin coating so I'm not sure if it really makes the paper any more heavy duty, but it gives it a water proof covering that makes it seem like it's more substantial or durable than plain paper. Also...I only put the silicone on the patterned side of the paper. Once my paper was dry, I decided to make an envelope for a small gift. I just folded up the 6 x 12" paper and added some 7gypsies Global paper tape on the edge. I wanted to stitch it closed so it will last longer. You will need to place a craft sheet (or even a piece of paper) under the envelope so that it will slide on the sewing machine when you stitch it. As you can see by the photo I placed the craft sheet to the left of where I am sewing (don't sew through your craft sheet). Stitch both sides of the envelope to close. Round the corners of the envelope flap. And there you have it, a reusable envelope. 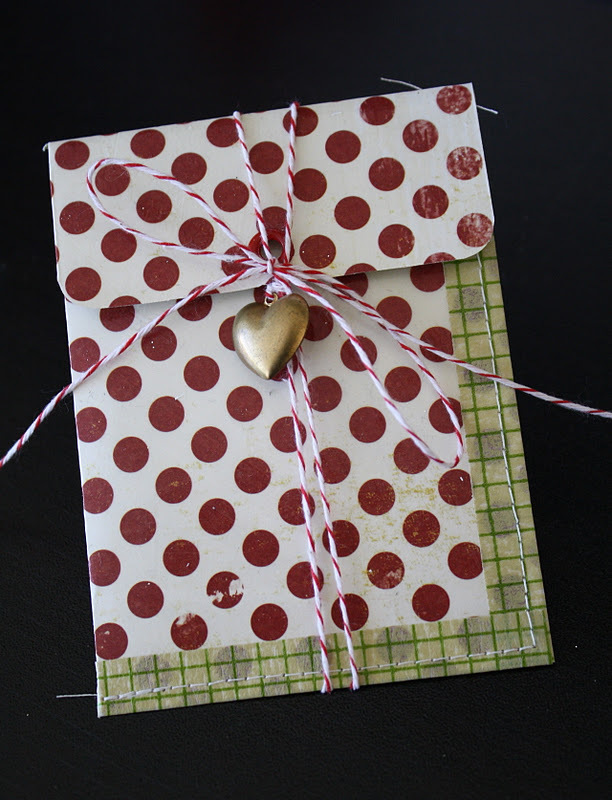 I am giving a lot of gift cards this year so why not make an envelope in a small size. Take your 6 x 12" paper and cut it in two so you have two, 6 x 6" squares. Fold the square in half, crease it. Open it back up and place your gift card on the paper for size. Cut along the top of the gift card and up the crease. Fold in half again (the green stripe you see is your flap). I thought it was too long so I trimmed off a bit. 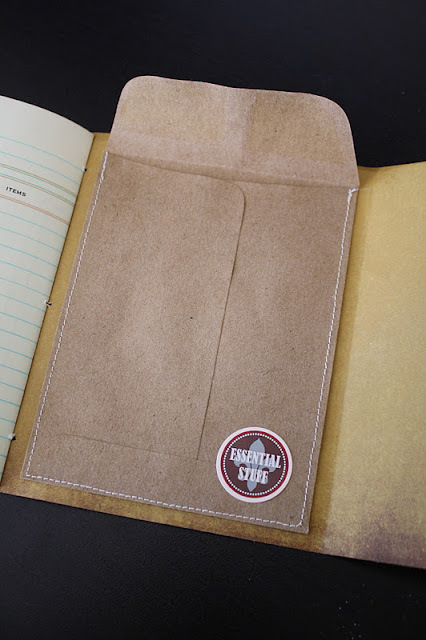 Add paper tape (Off the Wall) and stitch closed just like the last envelope. I punched out a half moon shape with a 1" circle punch so you can see the gift card when you open the flap. Add an eyelet, some red and white string and a charm and your ready to go. Don't forget the gift card. Then, just because I had more paper I decided to make a little notebook for my purse. Same 6 x 12" size paper. Same basic fold as the first envelope but I made the flap a bit longer. I cut 4 sheets of paper from a vintage ledger. Folded in half and creased. Add to the book, matching creases to stitch the signature. Punch three holes with a paper piercer or awl through both outside paper and ledger paper. Bend a piece of wire in half to make a "needle" for your string. NOTE: In the previous picture I showed the needle going into the center hole (2) from the inside. If you want the string to tie on the outside of the book you will need to start sewing from the outside to the inside leaving a 5" tail of string. 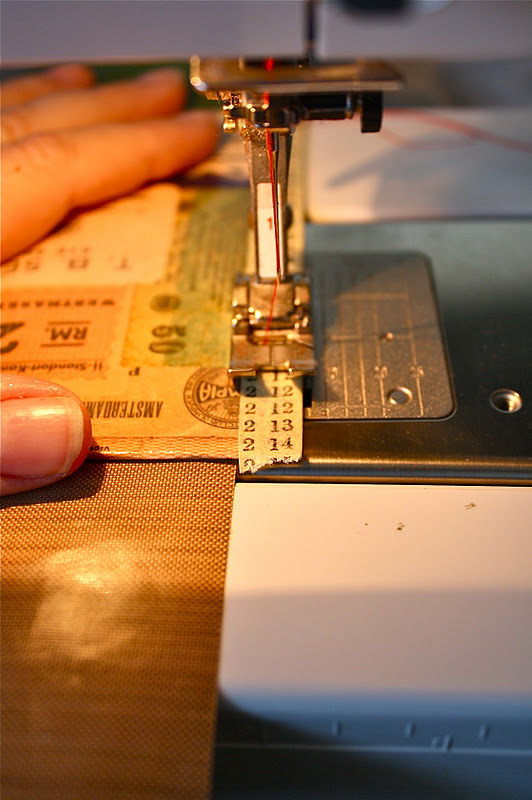 The stitching pattern is 2, 1, 2, 3 then tie both strings on the outside of the book. I stitched around a kraft envelope then added it to the back of the book with a tape runner. For a closure I used a simple 7gypsies Lille paper clip (big and sturdy). After I was done, I saw a scrap from the ledger paper on my desk and thought that might work good with the paperclip I choose, so I folded it over, stitched it closed and cut a dove tail on the end. I used some quick dry glue to keep it on the paper clip. I do realize that adding the flag on the paperclip made it impractical if I am really going to put this in my purse but I just liked it so much, maybe it can just be a notebook for my desk for now. Now if you came here from the Gypsy Journal today, you know there is one more thing I made. Great projects again! Thanks for the inspiration. Brilliant ideas! I love them all and can't wait to try this. Don't you just love being inspired by a trip to Target? Well...wow! What a cool, cheap, easy to do (except for that waiting part) technique! Love the projects and will be off to pick up some of this to try myself! Thanks for sharing the idea! Brilliant and I too have some gift cards to "make pretty" hmmm wonder if my hubby has the clear caulk? Thanks for the inspiration! thanks for all you have done to make it merry around our house this year. A home improvement product and scrapbook paper combined?!? I'm in love and I'm trying this very soon. 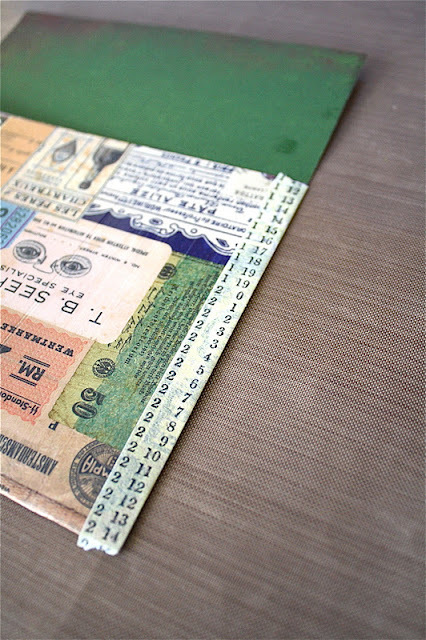 I also have a tonof vintage paper I wasn't sure what to do with and can't wait to make a few notebooks! Thank you. Love every single bit of it!! 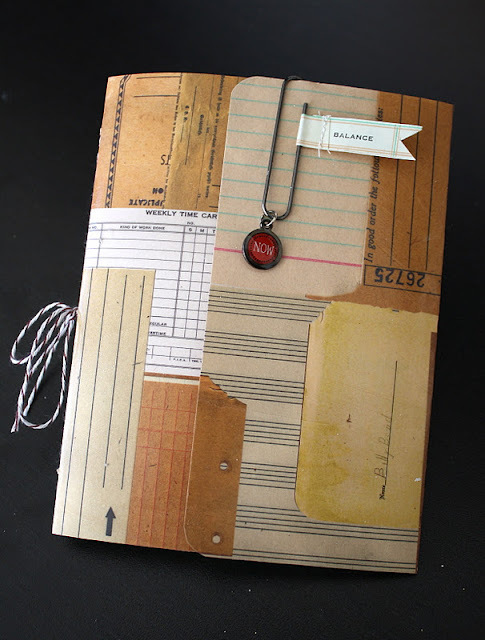 The idea, the materials, the notebook, the assembly, etc. etc.! :) Love! OMG! What a cool idea. And I'll venture a guess that hubby even has some silicone in his tool box. Time to go raid HIS stash!! So when are you coming to St Pete to share some of your wisdom?! Great ideas and inspiration as always - Happy Holidays! What great ideas! I'm definitely going to try the silicone coating! Have a wonderful Christmas! Love this! I make covers for my (seldom used anymore) checkbook and sew a piece of plastic onto the paper to make it more stable. I'm trying the caulk idea- looks nicer. Love all your designs. silicone... i've never even looked at it! and tks for sharing your great designs.